All transactions are safe and secure with a reliable history in online purchasing behind each of our associates. Buy The Hills Theme Song t-shirt to own Hills clothing and merchandise. This cool MTV Hills theme song tee celebrates Natasha Bedingfield's hit song from the MTV Hills TV series. 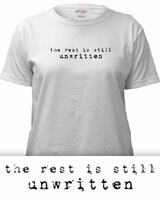 Wear this MTV The Hills shirt so that everyone knows that "the rest is still unwritten," especially when referring to the first two seasons of the television show, when Lauren Conrad and Whitney Port interned at the top teen fashion magazine, Teen Vogue. It was a busy time for LC, who had to balance classes at the Fashion Institute of Design & Merchandising with her job. In addition to The Hills Theme Song tee above, browse the Hills Clothing Gallery for more apparel like men's and women's clothes, kids shirts or hoodies.